I cycled out of work tonight, and it was just going to be a normal ride home as part of the winter commute. Like usual, I took it fairly easy as I cycled out into the traffic and across onto the cycle path running along the waterfront. I pulled up at the Evans Street junction, watching all the car traffic flow through as I had to stop for the usual 3 minute wait for the lights to change and then change again. Sigh ... just a normal night. I started up the little rise to the Cenotaph, a hill I both love and hate. It's here that I actually have to start putting some effort into riding, the legs being to wake up and sting just a little bit, the lungs start to work just a little bit as well and I think about the Bridge climb and Rosny Hill and all the other kilometres to come and think ... I hate this bit of the ride. But there's also a little bit of me that remembers nine weeks ago when I'd ride up this hill in granny gear wishing I had an easier gear still. I didn't have to glance down today to know that I had moved up two gears in those short weeks, and I was going up this hill faster, a lot faster, than I was nine weeks ago ... but still slowly. For a reason I can't even remember now I changed up a gear and pedaled a bit harder ... and it felt good. But it was still just a normal night. Then I started going up the bridge ... and I changed up a gear, then another one and I realised ... maybe this wasn't going to be a normal night, maybe this could be a special night, maybe this could be a sub 50 minute night. I live for sub 50 minute nights, they're my whole reason for riding these commutes, and so far in nine weeks I'd managed to score just two of them. I had to stop on the way up the bridge to let another cyclist past on his way down, and I didn't know it until later ... but even with that stop I still got a PR for the ride up that bridge. This wasn't going to be a normal light. However, as I say I didn't know that then, what I did know as I started heading up Rosny Hill was that my legs were hurting a little bit more than I wanted them too, but I knew there was a chance for a sub50, so I pushed through it as strongly as I could knowing there would be a little recovery time heading down the other side. There's road construction happening down past Rosny College, and I had a lot of traffic getting across Cambridge Road ... all time lost, but the delay getting across Cambridge Road also meant a greater run up the start of Clarence Street. And so I used it ... I refused to change out of the big gear as I attacked the hill, instead getting out of the seat and charging up it. I got to the traffic lights outside Shoreline on Clarence Street and I kept going. Every time I hurt, every time I wanted to change down a gear, I just kept telling myself that at this pace I was going to get my third sub50. This was not going to be an ordinary night. I hit the new bikepath just past Oceania Drive and knowing that this was a chance to make some real time, I changed up gears again and just turned and turned and turned my pedals refusing to slow down as I headed up the hill. Finally at the new junction with Tollard Road, I had to stop for a red light and so I quickly checked my strava time ... it was just under 33 minutes. I think my previous best at this point of the ride was 37 minutes and although the math's in my head weren't quite working in between my deep gasps for breath, it was going well enough that I realised that there was a chance to not only get a sub50, there was a chance, a real chance, of achieving what I had previously thought impossible ... a sub45. By the time my thoughts had got to this point I was already pedaling hard into Rokeby, and I didn't stop pedaling as I raced through Rokeby and out the other side. I eased back slightly, just ever so slightly, as I headed towards Rokeby Police Academy because I knew that losing a few seconds going along this straight could easily be won back by slightly fresher legs pushing up the short, steep climb past the roundabout. And it felt like it worked. I stayed in the big gear all the way up the hill and although I was sucking oxygen like never before at the top of the hill I was at the top of the hill. I was hurting at this stage, really hurting, but I just kept telling myself that if I kept pedaling, and pedaling hard, I would crack a sub47 (my fastest ever time by far) and I dreamed that maybe, just maybe, I could get a sub45. In my wildest dreams, I even thought of getting a time that started with a 43. The hardest thing about finishing a ride like this is full fingered gloves or more specifically getting your full fingered gloves off, and stopping the strava time. Just recently I got a time of 50.01 ... simply because I couldn't get my gloves off and my phone stopped because of wet sweaty hands not being compatible with iphone screens. But not today, today I had my gloves off, the phone code entered and the strava stopped in under six seconds (I was counting in my head). And it was a sub50. It was also a sub45. It was a 43:49 ride. It was a perfect ride, months ahead of when I ever expected to be able to do a ride this fast. But more than that it brought back the joy of why I ride and race, that turmoil of emotions, the feeling of invincibility, followed by impossibility, the charging into the unknown not knowing if you could win or lose. It is the joy of a bike. I went home via Rokeby hills again on Thursday night. Yea I got lost (again) and it took more time than I had allowed for to get home, but while everyone else was sitting in their nice warm cars, or at home in front of their TV's, I was sitting at the top of a new road that isn't yet on ListMap or even Google, breathing in big gulps of air as I looked at the world below me. Laid out in front of me was the whole of Hobart lit up at night ... just for me, just because I was there. I eventually found a track leading off into the bush (I knew it was there as I had come out on it the other day and seen the road), then I found a new track, and then I found a way out the other side ... but I haven't yet found a 'great' way through the hills from Tranmere to Rokeby. Which just means I can go back and try again next week. I also found my way through Rokeby this time, and rocked up at home knowing that I had rocked another week of the Winter Commute Challenge (3 rides). Six weeks to me, two to winter. Twenty one cycling days to me, with just twelve going to winter. I look so good on that bike. It seems that at least once a week I will experience a close encounter with a vehicle, and I would guess that in most cases the driver is probably either oblivious to the terror they've just caused, or like me on occasion, they're sitting in their car thinking "oops, that was a bit close ... sorry Mr cyclist"
I had one car swerve at me (deliberately) this week (I really don't know what I do to deserve this attention) and another that came up behind me on a corner near my home and who decided I was unreasonably blocking the road (it is a sharp ninety degree corner with lots of glass and loose gravel on the outside so at night I have to sit out in the middle of the road for about 5 seconds to be safe) ... and so he was tight on my back wheel, horn blaring at me, to let me know I was holding him up for two seconds. I confess this guy really p*ssed me off, so much so that I figured that they must be near their home or they wouldn't be on this road, and so took the unprecedented action of racing off after them and trying to hunt them down ... but they got away. I also had a Government vehicle go flying past me coming out of Rokeby. 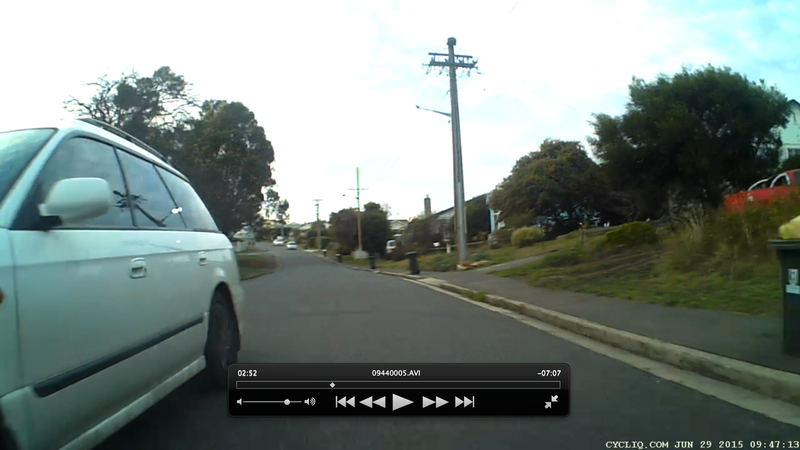 It went past me way too fast, and way too close and I was so p*ssed off, I even memorised the number plate. Then I got home, jumped off the bike ... and realised my rear light wasn't on. Flat battery (to explain, it was a light I'd moved from an old bike, and I hadn't charged the battery before putting it on). I kind of felt pretty stupid after that ... albeit that I was still wearing a reflective backpack and a second (very powerful) rear light that was happily flashing away on my backpack ... thank god for redundancy. Still .. it is a good reminder that we all make mistakes, and just because we have a close encounter, doesn't mean it's deliberate or that there's any venom in it. Still ... a metre does matter ... it really, really does. Winter Commute Challenge - Week 7 - The Revenge of the Road. I already know I have a low emotional intelligence IQ (I've been tested), but this week I think I learnt I also have a non-existent "The World is trying to tell you something" IQ. Monday started as normal. I pulled on the cycling gear, went down to the garage and pulled out the bike and put it next to the car, put the gloves and helmet on, closed and locked the garage, turned to the bike ... and then noticed that my rear tyre was flat. I think it also started to rain, though maybe that is just my imagination trying to add extra colour to what in my head was already a fairly unhappy moment. Do I fix the tyre? do I jump on another bike? or do I just say stuff it, and take the car. I (at least for the next two minutes) did none of these things. I just stood there staring at my bike willing the tyre to re-inflate itself. Which, in case you're hoping that this might be a miracle story, it didn't. Then I finally made a decision, trudged back upstairs, got changed out of my road cycling shoes and into my mountain bike shoes, went back down to the garage, got out the mountain bike and finally set off to work. That night I decided to take advantage of having a mountain bike and instead of my usual route, I jumped onto the Clarence Foreshore Trail, near Bellerive Beach, and followed that around to Tranmere and from there sort of, kind of, took a short cut through the trails over the Rokeby Hills. That went well, albeit with the caveat that my shortcut added about 45 minutes to what is usually a one hour ride because I got completely turned around and lost up in those hills due to new subdivisions and tracks on maps not existing on the ground. Then I got lost in Rokeby as well. It also definitely, 100% definitely, poured down on the way home because I remember getting home cold and wet and not in the mood to repair my flat road bike tyre. This is why I also commuted into work on Tuesday with my mountain bike, which was going splendidly until I was on my way home ... and my front tyre punctured (but resealed) going down Rosny Hill almost sending me sliding across the road after going around a corner a bit too fast and almost losing the front wheel. Fortunately, my mountain bike is tubeless, so all I had to do was reinflate it and let the pressure do the rest. Unfortunately, the only pump I had with me was one of those tiny little pocket pumps, so it was 10 minutes and 3,320 pumps later before I was back on my way home. I also decided to skip a second attempt at the Tranmere - Rokeby connection due to my tyre problems. Wednesday, I'd volunteered to take the dogs to the groomers and go into work a bit late and Thursday I arranged to work from home in the afternoon and monster sit the kids who are on school holidays, meaning no riding on those days. This brought me into Friday on a score of two days ridden, two days missed. Having the afternoon off on Thursday did mean I finally spent the required 5 minutes needed to change out my flat road bike tube (turned out the tube had split at the valve stem so no repeat puncture problems) meaning that I could do a fast commute into work. This was good as Friday was cold, wet and freezing. So I got the bike out (I even checked that the tyres were inflated) and then jumped on, turned on strava and ... WTF? Strava had updated it's iOS App to something new called "Strava Live" overnight, and it was all different and promising to give me real time this and real time that and all I was thinking is I DON'T WANT THAT AS I HAVE LIMITED MONTHLY DOWNLOAD LIMITS!!! I just want to ride to work using the GPS on the phone and then upload my data. A hundred metres down the road, I knew something was wrong as the tyre was plop, plop, plop, plopping down the road at every revolution of the wheel and a closer examination showed that my repaired tyre hadn't seated properly and there was a big bulge right near the valve. So, off the bike I went and, in the rain, I walked back to the house, unlocked the garage and then pfaffed around for 10 minutes trying to get the tube to reseat. Which of course it didn't. So, back upstairs, change the cycling shoes, back on the mountain bike and off to work I went. It truly was an unfun day for cycling, demonstrated by the fact that when I pulled into work just before 9am, the bike room was still practically empty and the change room looked like it hadn't yet been used. Still, I did the final slog home on Friday night, meaning yet another week to me in the cycle challenge! That's five weeks to me, two weeks to winter, and if my memory serves me right, that's 18 cycling days to 12 misses. But probably the bit I'm most pleased about ... on Wednesday and Thursday when I didn't cycle in ... I really missed it, and that's a good thing. So the other week, I was skipping through random shows on Netflix trying to find some mindless Friday night viewing, when I came across a movie that sort of sung out to me ... fat, sick and nearly dead. This is basically a docu-movie about a guy (Joe Cross) who goes on a 60 day juice diet as he travels across the USA and lectures his world view at a lot of people while losing lots of weight (33kgs from memory). It's actually a pretty reasonable watch (especially as it's free on Netflix) and it got me inspired to try and do something about my weight. So I checked out their community website and decided ... why not give it a try? With this decision made, the next step was buying a juicer. I decided to start my juice diet on Saturday (as Kim would be away for the weekend giving me 48 hours to be grumpy with just me and the dogs present). Saturday went pretty well, a yummy baked fruit berry and apple thing for breakfast, and then for lunch, little Zara (who had joined me unexpectedly as she was feeling sick and Kim needed to run Markus to seventeen birthday parties, 23 games of soccer and god knows what else) and I churned through a huge amount of apples, carrots and ginger to make our first juice ..
And it was good (yes, she did actually drink it and more). I didn't enjoy all the cleaning up afterwards, and I have to admit throwing away all that solid matter seemed a bit wrong to me, but hey this was what I had signed up for, so this is what I'd do. Little Zara took off with Kim later in the day to spend the night in Carlton, leaving me on my own on Saturday night with all the joys of a rumbling stomach, a building headache, but a determination to see this through ... I was after all detoxing and that could only be for the better. Then, by complete coincidence, I was watching a bit of catch up television to distract myself from my growing headache, when, part way through an episode of the checkout, a section came on ... on detox diets. ... and (at about 3:40seconds) somebody who was actually a scientist and who understood nutrition dropped a bombshell ... all these feelings I had of nausea, headaches etc. weren't my body 'detoxing and cleansing' itself (apparently my liver does this), it was my body screaming out for energy and going into starvation mode. All this sh*t I was feeling wasn't actually making me one jot healthier - it was my body screaming out that this wasn't what it needed. Yea - reminder note to myself: that's why science should be a peer reviewed thing, and not something you learn about on Netflix and a marketers website. However, denial and commitment are strong forces, and not really wanting to believe how easily I'd been suckered, I went up to bed and spent the night checking out a number of reputable medical websites, and sure enough they all confirmed the same thing ... while a detox diet can be used to rapidly lose weight, it's not a very good way to lose weight in the long term, and none of the claimed 'detox' benefits are actually proven. I still stuck to my detox diet for another 16 hours as I considered the pros and cons of using the juicing approach to get a jump start on some weight loss but then decided that a healthy weight loss approach just makes more long term sense, and so for lunch on Sunday I had a lovely chicken salad wrap (after yet another visit to the shops to buy more food). So that was my 36 hour juice diet. I wouldn't have got much change from $250 (which no doubt is why there's so many businesses out there telling me why detox and juice diets are so good) but it was still fun to try. I think the interesting thing for me though (two weeks later) is the results. I have continued on what I would decided to call a chaotic regime of health and exercise (stay tuned for the book and video coming to you soon through this blog) for the same period I planned on doing my juice diet. I somewhat arbitrarily decided to go completely caffeine and alcohol and soft drink free for seven days (and that was hell), but otherwise have just been eating what I consider to be health food and food portions and I've been doing my cycle commuting. I've lost a further 5.1kgs in 14 days. Now the interesting thing is that if I'd stuck to the detox diet, I'd be putting that down to the detox diet and be raving about it. But I didn't stick to it, I never really went hungry, I had energy to exercise and I just changed little things (I drank water instead of wine, I had sushi or soup for lunch, and I didn't have dessert after dinner). And I still got a pretty good result. I'll just have to go out and buy the book again. I seem to have an inbuilt need to destroy myself. Whether it's boot-camps or competing in fun runs and mountain bike races, there always seems to be a point where I'll decide I can do more. It's a point where I know that although I can't ever win a race, I can win a bit of it ... so I'll utterly destroy myself doing so. I'll sprint up a hill like I was in a hundred meter race, not a 10km one ... and I'll win. In my own way I'll be shouting out to the world "I can always do more, I can always find more, I can always be more". Then I'll usually collapse into a heap and die in my own private world of pain. I'm a bit worried that this may have been my week of destroying myself in the commuter challenge, which means next week ... I crash in a heap and die. I also like the fact that I spent nearly 10 hours on the bike this week just commuting. What did I say about destroying myself? The week only had a few highlights worth mentioning. I only had one motorist wind down their window and scream "get off the f*cking road you c*nt" and no really close encounters ... which was much more pleasant than usual. 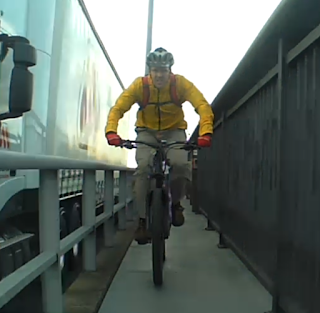 Balancing that on Tuesday I let off my own bit of vitriol as I passed a group of cyclists riding across the bridge well after dark with no lights and no helmets. 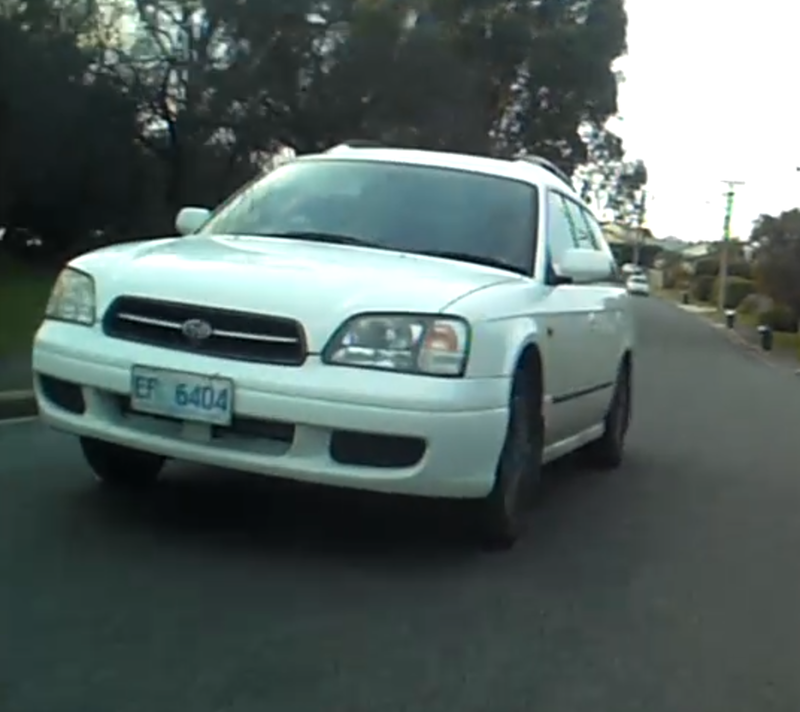 The kind of cyclists which give the rest of us a bad name. So I let them know my thoughts about that. but unfortunately, although toasty warm, you try using a flight deck gear switching system on a road bike with those big boys on. Yep, they were thrown back into the storage box on Thursday night. This, if you haven't already figured it out, is what Roche's Beach Road looks from a bike like at 37km/hr when your front bike suddenly blacks out. Note to self: that clever idea of only pushing the power cable together lightly so it's easier to unplug and recharge each night doesn't seem so smart when it unplugs itself at 37km/hr at night. The end result of my mega-week is of course a weekly win to me. It also means that I jump to 15 on the point score while winter remains on a pitiful, embarrassing 10 points, and who cares about the medium race difficulty unless ... well I crash and die next week as predicted. I'm sure that somewhere in Hobart right now there is a lady telling this same story. Coming up behind a pedestrian on the bridge isn't unusual, and often they will hear you as you clatter over a lose metal plate, or at night they'll see your lights coming up behind them, and there's a fairly well established politeness to it all as the pedestrian squeezes to one side of the walkway or other and we cyclists squeeze past with a polite "thank you". But then, every now and then,there is an encounter like this morning where you come up behind someone and they just don't know you're there. My usual approach is that when I'm five or so metres behind them (and slowed down to their pace) I call out (just above traffic volume) "just coming up behind you". Which work 7 times out of 10 . Sometimes they're a little shocked (and I've been there as a pedestrian and know what it's like), but usually they just step to the side and once again you do the shuffle-squeeze past. But sometimes they don't hear this call, as was the case this morning, and so after a few seconds pass, I call out a second time "Excuse me ... may I just get past" ... usually at about the same volume. This usually always works, but this morning ... nothing. I looked at the person in front of me and for the first time it registered that they had a big hat, scarf etc. on and the insight suddenly hit me ... she's got earphones on and is listening to music, which is why she can't hear me. So at a louder volume, I call out "EXCUSE me, just trying to get past"
Finally, after a few more seconds, I really ratchet the volume up and yell out "EXCUSE ME". I vainly try to explain ... "Sorry, I did call out a few times"
But I don't think it registered, and I was already 20 metres in front of her before it all sank in. So to that lady, somewhere in Hobart, that might now hate those speeding, screaming cyclists on the bridge ... I'm sorry. On such partial interactions are misunderstandings built between pedestrians, cyclists and motorists built., so I really am sorry. The mirror on the car touched my sleeve as it overtook at about 45km/hr. Even without vehicle mishaps, Monday mornings never seem to feel good on the bike. I usually get to the first little climb coming up out of Lauderdale and my legs just seem to scream at me saying "Nup, haven't got it, let's pack this stupid challenge in and go get the car", however somewhere between there and Clarence street some sort of magic happens, or maybe it's just that the blood gets flowing in the legs and I begin to realise that work is not so far away really ... and it all starts to feel better, it feels worth it ... until I find myself at the bottom of the least favourite hill of my daily commute - Rosny Hill. I dislike the climb up Rosny Hill (in both directions) due to the equation that: my weight + my gearing + the gradient of that hill = hurties, and I don't like hurties. So this morning, I was grinding my way up the steepest part of this hill (you know the corner if you ride it) when a certain, nameless, mountain biker went flying past me like I was standing still completely destroying any confidence I had been building up over these past weeks that maybe, just maybe, all this riding was doing me some good. However, to demonstrate the fickleness of the day ... after a fairly poor morning, I then went and smashed out my fastest ever commute home (albeit with quite a bit of wind assistance) and picked up five strava PRs ... haven't bagged one of those for a while. Tuesday is my drop Zara off at the bus and do a mini-commute day, and I decided to park on the Lindisfarne side of the bridge this week and enjoy a pleasant ride in on the up-river side of the bridge. The main thing I noticed from the day (on strava, not on the road) is how many other people seem to be commuting at the moment. Now I do realise that I'm most likely noticing this simply because I'm now so focused on commuting that I'm therefore noticing the other people who are also commuting in every day, but in my own hubris I've decided that I prefer the explanation where all these other people are in fact joining me on my winter commute challenge (even if they don't know it) so I'm going to go with that explanation. Wednesday was another day of infamy with the second police blitz this year on the Evans Street intersection resulting in fifty-five cyclists and pedestrians getting cautioned for riding through the red light there (See mercury article). I meanwhile was oblivious to it all until I got into work, as in a moment of very un-john like luck, I hit that magic five second window where the bicycle crossing light was actually green and so I sailed right on through and didn't even see the police. I won't mention a certain beautiful, girlfriend who may have been walking into work through that same intersection earlier in the day and who had not been so lucky (because this post is all about not naming people). After a few days of mild and enjoyable riding, Thursday saw the return of snow to the mountain and a chill to the air. It also saw me hit a new problem ... I only did half a commute on Thursday (I rode in, but not home as Marcus wanted to go to Hog's Breath for his birthday dinner). Now going out to dinner didn't seem to me to be a valid enough reason to call a 'bye', but what do I do? Do I give winter the point for the day? Well that didn't seem fair seeing I had put the effort into at least riding into work and I also figured that if I applied that rule then any motivation for half day commutes would disappear. Do I just call it a bye if I commute in, and not out? This seemed liked the simplest solution, but didn't really recognise my ride in which got under the claw a bit, but the only other option was to give me and winter half a point each. To be honest, although somewhat clumsy this did seem the best solution, but then I have to start adding up half days and that seems a hassle ... so I've decided at this point just to call it a bye, reserving my right to change this later if more half day commutes appear. Did I mention just how much time I have to think over stupid things in great detail when commuting two hours a day? Despite all my effort this week, the sad reality was that come Friday morning, it was a tied 2:2 heat which meant that for the second week in a row I had to pull on my sweaty and smelly cycling gear and head into work on the bike on Friday. And to make matters worse, because my road bike was at work, I had to ride in on my mountain bike. ... or maybe hadn't quite opened and I cycled down it in oblivious bliss. Definitely one of those two options. With three full commutes, one half commute (bye) and one mini-commute (medium bye) that means I win the week with three weeks to winters two fails. On the points score (which I'm sure no one is interested in until I start winning), Winter creeps up to 11 points and I've made a big move up to 10 points, so winter is still ahead, but I'm rapidly closing. In the medium category, winter scored no points this week, and I scored three, meaning I move into the front at 9 points to winter and 10 points to me. Woo Hoo ... but I keep reminding myself that if this was the Tour De France, then this would only be the end of week one and there is a lot of cycling still to go ... and I have the attention span of a gold fish when it comes to challenges like this. On other good news, despite the humbling fly-by of he-who-shan't-be-named (maybe I'll call him Voldemort from now on) on Monday, all this cycling is doing me some good dropping 2.7kgs in the month ... (but with a heck of a long way still to go).